Along with the Jade™ 20’s sleek & modern design, it is also complete with a large sewing space, built-in accessory compartment, and 80 beautiful stitches. The SINGER® PATCHWORK™ quilting and sewing machine is perfect for new and skilled quilters alike with features including 100 built-in stitches and 15 quilting stitches. The SINGER 4452 Heavy Duty sewing machine features an extra-high sewing speed of 1,100 stitches per minute that allows you to plow through projects 30% faster than a standard sewing machine. 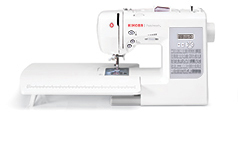 Features adjustable cutting width and stitch length, color-coded lay-in threading, 4/3/2 thread capability, and 1,300 stitches-per-minute with automatic fabric trimming. 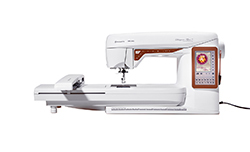 Features SwiftSmart™ threading system, Drop and Sew™ bobbin system, 3 StayBright™ LED lights, extra large sewing space, 24 built-in stitches and quick view stitch setting. 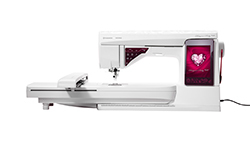 Features 23 built-in stitches, a fully automatic 1-step buttonhole, adjustable stitch length and an automatic needle threader.